It is not often that you get an opportunity to give someone something that they have always wished for, and still so, it becomes very difficult to get the the present of their choice. What comes to your rescue is the amazing choice of giving your loved ones Gift Cards from their favourite store and brands. The amazing Gift Cards offered by Unlimited are the best gifting option for your friends and family. You are gifting them the choice of getting their own gift and nothing can be better than that. This could be the best gift for someone who loves fashion because when it comes to fashion, your choices should be infinite. Because fashion is unlimited! You can get Unlimited products at the best prices with Unlimited Gift Cards and even enjoy the best deals and discount from GrabOn. Unlimited is part of the $ 3 billion Arvind Group which has a major presence in textiles and apparel worldwide. Being a part of such a renowned group, Unlimited tends to provide the best to their customers and offer them the best quality products at the most amazing prices. You will not be disappointed by the quality of products that they offer. You should definitely check them out if you are going gift someone who is all about comfort and quality. The Gift Cards offered by Unlimited can be reloaded and are a 100% secure. All the Gift Cards are free from the constriction of fixed denominations. They are convenient to carry and form one of the best gifting solutions. These cards are accepted at all Unlimited Store across the country. With Unlimited you can gift someone the scope for unlimited happiness. Gift Cards give you the option to choose from a plethora of products and gifting someone a gift card means giving them the freedom of making a choice which is a whole another part of gifting made convenient and easy. Apart from the amazing Gift Cards, GrabOn provides you the best and latest offers & deals on purchase made through Unlimited. Choose from a wide range of fashion Cards offered by Unlimited and make the day of your loved and dear ones, give the best gift to your friends, family and special ones by giving them the chance of choosing their own gifts. Grab the best offers on Gift Cards through GrabOn; choose the best! 1. What does an Unlimited Gift Card do? 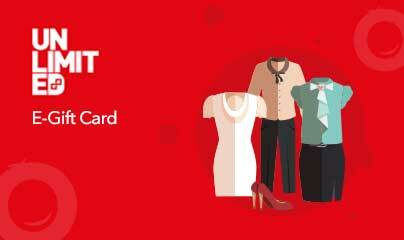 With an Unlimited Gift Card, you can gift your loved ones the choice to change their wardrobe. The latest collection at Arvind Store has all the trendy and classy apparels for you and your friends to pick from. You can buy the Gift Cards from a list of denominations and gift your dear ones on any special occasion. 2. What kind of Gift Cards are available for us to buy and how can I use them? Select items for purchase. Click on the 'Proceed to Pay' option on the checkout page. In the choose payment method page select the 'Unlimited Gift Card' option. Enter your 16-digit gift card number and the 6-digit PIN number provided on your gift card. If your order total exceeds the gift card value, you will be asked to select an additional payment method. And, if the order total is less than your gift card value, then the balance will be credited back to your gift card. This can be used for the next purchase. 3. What happens to the Unlimited Gift Card that I have used if I cancel my purchase? We request you to get in touch with our customer support regarding the available options of repayment or transaction failure. You can write to us at giftcards@grabon.in or call on 7997692233 and our team will get back to you. 4. What can I do with an Unlimited Gift Card? You can use your Unlimited Gift Card to purchase any product available on the Unlimited Store, online or offline. You can also present the gift cards to your friends and family on any special occasion. 5. How do I find my current balance on my Unlimited gift card? Enter your Unlimited gift voucher's or card's number and PIN. Click enter and your balance will show. 6. How will I receive my Unlimited Gift Card? Your Unlimited Gift Card will be mailed to the recipient’s email id once you complete the purchase. 7. What if the transaction amount of my purchase is lesser than the Gift Card value? You can use the remaining balance during your next purchase. This e-Gift Card is valid in Unlimited & Megamart stores of Arvind. Valid for 180 days from the date of activation. This e-Gift Card cannot be redeemed for cash or used to pay a credit note. Mutilated or defaced e-Gift Cards will not be honored. In case the value of the merchandise is less than the value of e-Gift Card, the difference will remain available till card is valid or value used up whichever is earlier. No duplicate will be issued if this card is lost or misplaced. E-Gift Cards are not accepted at the food, café and mobile outlets (if any) at Unlimited & Megamart Stores. In case of promotions or events, special conditions will be applicable with regards to use of the e-Gift Cards. Only valid e-Gift Card will be accepted for redemption, e-gift cards can be redeemed just once. Any dispute arising out of these terms of this e-Gift Card shall be subject to Bangalore jurisdiction.